The establishment of Aberystwyth University is one of the great romantic, indeed heroic, stories of modern Welsh history. It was the work of a small group of patriots, led by Hugh Owen, a London Welshman, who sought from the 1850s onwards to raise enough money by public and private subscription to establish a college of university status in Wales. It was almost an impossible ambition. 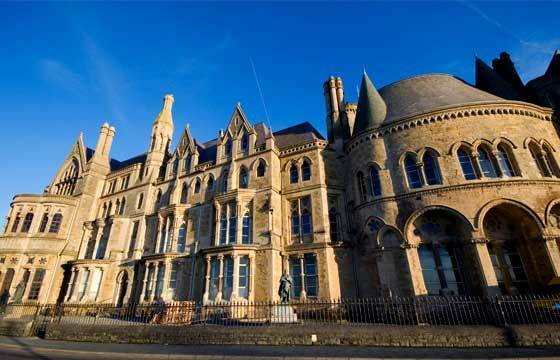 In 1872, the University was opened in a half-finished hotel building on the sea front in Aberystwyth. There were 26 ill-prepared students and a teaching staff of three. From the 1960s the University relocated from the seafront to the Penglais campus. This finely landscaped site enjoys spectacular views over the town of Aberystwyth and the sea. New buildings, including major arts and science developments, halls of residence, a magnificent Arts Centre and first rate sports facilities are located here. Most recently, major investment from the Welsh Assembly Government has led to the founding of the Institute of Biological, Environmental and Rural Sciences. In 2007, all the colleges of the University of Wales entered a new phase of existence as independent universities, though strong bonds of co-operation remain, re-affirmed in the St David Day accord of 2009 between Aberystwyth and the other four leading universities of Wales. Newly independent, Aberystwyth University reflects with pride on the heritage of its past, and faces the future with the confidence. Studying at Aberystwyth for international students is an opportunity not to be missed. A friendly welcome, great student satisfaction and a superb high-quality learning environment in a beautiful location on the west coast of Wales, awaits our international students. The IRC (International Recruitment and Collaboration) is responsible for promoting the University overseas and co-ordinates student recruitment, the development and nurturing of institutional and other links worldwide, and the enhancement of study abroad and student exchange opportunities. We have over 3,500 spaces in a variety of accommodation types, a range of campus restaurants, cafe and snack outlets and an accomplished conference and events service. The University guarantees a place in Residences to new first year undergraduate students who apply for accommodation before the 1st of August. We have invested over 24m pounds in residences in recent years and are able to offer accommodation in an attractive, neighbourly environment. Furthermore, all our residents enjoy additional benefits including computer network connections in all study-bedrooms and inclusive room contents insurance. Aberystwyth University has up to 10 International Excellence Undergraduate Scholarships available each year, for students applying to study a full degree (not gaining entry to Years 2 or 3 of the course). The School of Management and Business Aberystwyth Ambassador Bursaries - 500 pounds - for international students on undergraduate programmes. These Bursaries are awarded on a competitive basis for academic merit. Students accepting a Bursary will be expected to undertake significant marketing responsibilities on behalf of the School of Management and Business. Up to 59 scholarships, each worth either 2000 or 3000 pounds towards tuition fees will be available for full-time non-EU students on taught Masters courses that commence in September 2010. The scholarships will be awarded for academic excellence (minimum of a UK upper second class honours degree or the equivalent for the 2000 pounds award and a minmum of a UK first class honours degree or equivalent for the 3000 pounds award, either already achieved or predicted by the candidate awarding university). In order to be considered for one of these awards, an application for a place on a taught Masters degree at Aberystwyth University must be received by 31st July 2010. Aberystwyth University offers a 10% discount in Taught Masters tuition fees for Aberystwyth University graduates registering for study in 2010. The Aber-Grad Discount Scheme applies to both home and overseas students. If you hold a First Class Bachelors (Hons.) degree, then this discount will be increased to 20% of your tuition fees.